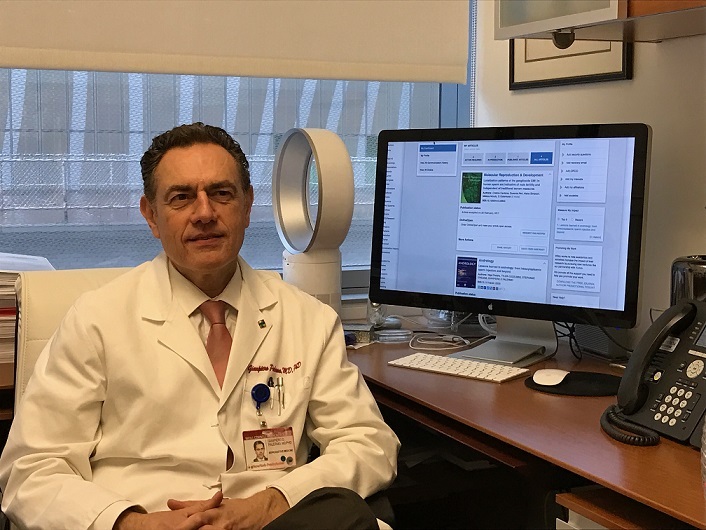 Dr. Gianpiero Palermo is the director of assisted fertilization, director of the Andrology Laboratory, the Blavatnik Family Professor of Reproductive Medicine and professor of embryology in obstetrics and gynecology in the Ronald O. Perelman and Claudia Cohen Center for Reproductive Medicine. He lives on the Upper East Side, close to campus. When did you join Weill Cornell Medicine? I joined Weill Cornell Medicine in September 1993. I take care of the andrology services, screening the male partner of an infertile couple. My team also carries out a procedure of in vitro insemination called intracytoplasmic sperm injection, in which a single sperm is directly injected into an egg to achieve fertilization. This procedure represents about 80% of all in vitro fertilization procedures at Weill Cornell Medicine. Finally, we conduct research. Making people happy by giving them a chance at pregnancy. That’s the most fulfilling. The other thing I enjoy is interacting with my young collaborators. To be able to build a team, train younger employees and see them succeed is very rewarding. We have the right environment here for success. But we also work very hard, and we tend to the patient very intensely. We always try to be gentle and to create a nice atmosphere for our patients. For me, a good attitude and positive behavior toward the patient is paramount. I am also a clinician, and I recently became a fellow of the American College of Obstetrics and Gynecology. And now I am working on my Reproductive Endocrinology board, so I never stop pursuing high-level education. I like being on a boat. It makes me feel free, or at least gives me the illusion! I love NYC. I am a foreigner who has lived here for many years, so in a way, I am the typical New Yorker. I love the diversity, the diversity of cuisines, the culture, the energy. I am a high-energy person, and I like the fast pace of the environment here.